Occurring more than 300 million years ago, dragonflies form one of the most ancient groups of insects. With more than 6 000 species world-wide, they have fascinated numerous civilisations over the ages. Their many popular names (in the Middle Ages, for example, they were known as ‘Satan’s needles’, ‘Devil’s arrows’ and ‘dragon’s whores’) illustrate the fear and demonic reputation they have held over a long period. However, in the Far East, these insects are regarded with great respect, notably in Japan – the town of Nakamara has even devoted a museum to them, unique of its type – where they represent a symbol of force and bravery, and their silhouette is regarded as synonymous with good luck and victory. Emblems of our water courses and wetland areas, dragonflies are among the most popular of insects. However, every fisherman, walker or naturalist one meets by the riverside will tell you that these insects are becoming less and less numerous. Such anecdotal evidence has motivated societies for nature conservation and the environment in the Poitou-Charentes to conduct a survey to refine our knowledge of these insects. 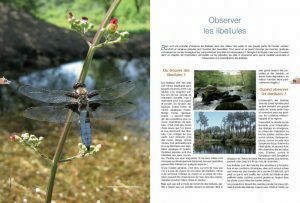 The aim is to conserve dragonfly populations and their habitats and to bring dragonflies to the attention of the public, especially those involved in decision-making, principally by the publication of this book. The dragonflies, or Odonata, are one of the earliest groups of insects, first appearing during the age of the dinosaurs. The European species are divided into 2 major groups : the Zygoptera, or damselflies, and the Anisoptera, or true dragonflies. The 6000 species described in the world are morphologically uniform but they have developed diverse ecologies allowing them to colonise nearly the entire terrestrial surface of the planet. Compared with many other groups of organisms, the morphology, life-cycle and general ecology of members of the Odonata are relatively homogeneous. Their most striking characteristic is that they are dependant on 2 radically different media – the aquatic one in which their larvae develop and the aerial world of the adults. This life-cycle switch is accompanied by fundamental physiological transformations (changes in methods of respiration, development of the organs of reproduction), morphological transformations (use of wings) and, conspicuously, behavioural transformations (changes in hunting methods, development of reproductive behaviour). Although dragonflies can be found in many different habitats and throughout much of the year, certain areas and certain periods are most suitable. To know where and when to look for them, together with a knowledge of their ecology and behaviour are very valuable. In this chapter, information on flight periods, sites to visit and the equipment needed to observe and identify them is provided. Damseflies (Zygoptera) tend to adopt a look-out post (a plant stem or twig by the waterside) and when disturbed, take off, only to re-alight again in exactly the same place a few moments later. Approach to within 50 cm of the damselfly and focus the camera before the insect takes off. When it departs, remain as still as possible, keeping your camera focused on its perch, and then, from the moment you have it in the view-finder you have several seconds in which to press the shutter. True dragonflies (Anisoptera) tend to fly hardly without stopping and it’s even more difficult to photograph them successfully ! You need to stand quietly in the flight area of your dragonfly and wait until it becomes used to your presence. With a little luck it will come to investigate you, hovering before you for a second or two. This is the time you have to frame it in the field of view and press the shutter – not easy ? The identification of dragonflies begins with an ‘apprenticeship’. Start by learning to recognise the commonest species. To conduct a systematic survey of the species present in a locality one must obey one simple rule : to identify with certainty each species present on the site. To do this, capture is essential. In this chapter, identification keys for each of the families are provided. Identification should be based on several characters and on mature individuals. Sure identification of immature or worn examples is more difficult. Binoculars are useful for observing dragonflies, particularly Anisoptera, in the field. The use of photography, with the aim of recording salient features, is useful in constructing a personal reference collection and in confirming identifications. The identification of the exuviae, the skin of the larva from which the adult has emerged, also provides valuable information on the dynamics of a population. Although much less spectacular than the adults, the forms of the exuviae are very diverse. Never to name a species where a doubt remains must remain the rule as much for the larvae and exuviae as for the adults. 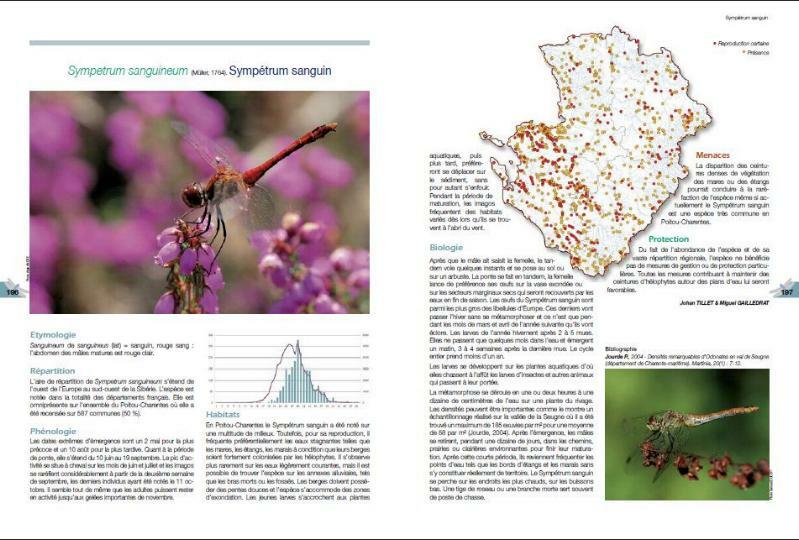 From the results obtained during our surveys, we have tried to identify the range of dragonflies typical of each of the principal habitat types to be found in the Poitou-Charentes. For each of these habitats, only the species for which we have proof of reproduction have been included. 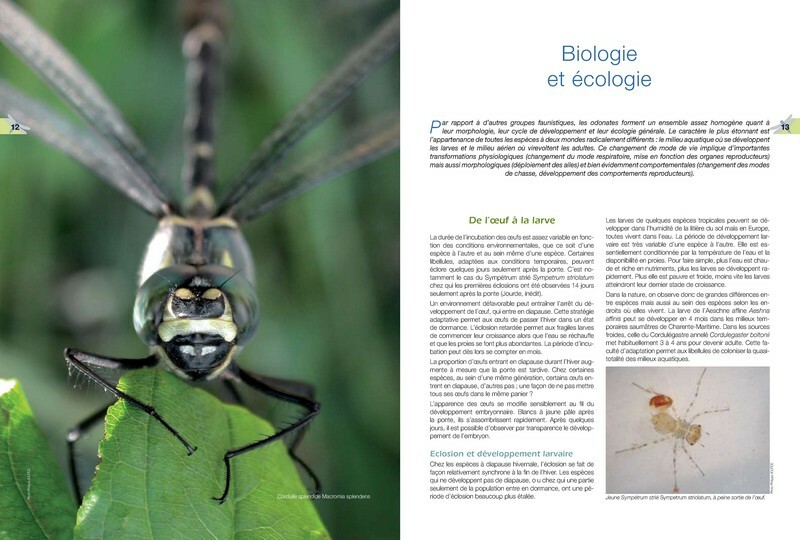 Nearly 40% of the species of dragonflies of the Poitou-Charentes are included in the regional list of threatened species. Most suffer from the impact of human activities on humid zones, which constitute an ecosystem particularly fragile and vulnerable. The profound changes to which these areas are submitted, outweigh the adaptive capabilities of many specialised species. Although dragonflies are considered as poor bio-indicators because they are quite tolerant of environmental change, the decline of their populations indicates the overall sad state of our wildlife heritage. 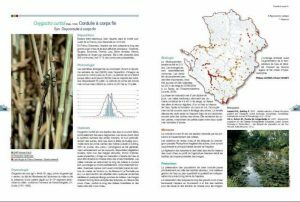 Of the 68 species of Odonata present in the Poitou-Charentes, 10 are protected at the European and national level. However, an evaluation of the conservation status of our species indicates that 29 are gravely threatened on a national and regional scale. 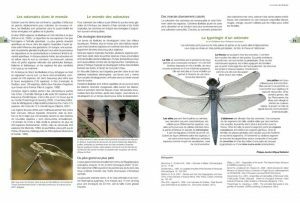 The conservation of dragonflies is provided by comprehensive measures for the protection of humid zones and a better consideration of the requirements of species in the management of natural habitats. The construction of ornamental ponds in gardens could begin to play an important role in the protection of certain species. 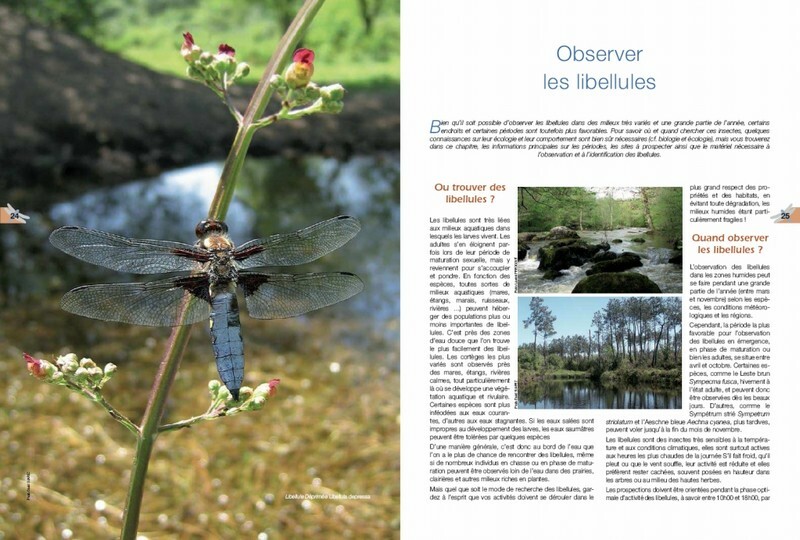 Just read a laudatory critical of « Libellules du Poitou-Charentes« , from Peter J. Mill, British Dragonfly Society.